Besides an appointment for your Christmas pedi, this is the easiest thing you will make during the holiday season. Really, it is. I've seen lots of recipes that require more steps, like chopping pieces of peppermint candy in the food processor or making icing. They are lovely to look at, but not necessary. 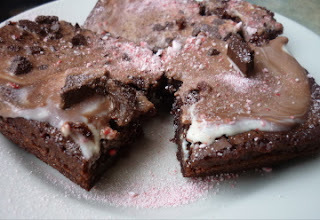 For the simplest version, you will need two main things: A box of peppermint bark candy and your favorite brownie mix. 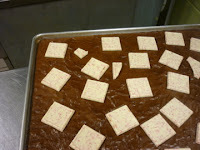 You could also make brownies from scratch, like my recipe for Helen Gurley Brownies, found here. 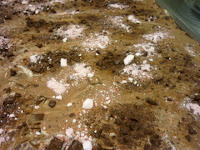 Peppermint bark is easily found in discount stores such as Ross, Marshall's, TJ Maxx or Homegoods. After a false start to my holiday baking, I now have two one-pound boxes in my pantry, ready to go. I made mine yesterday with Ghiradelli Squares, the only thing available at the time. The little squares must be individually unwrapped and cost a bit more per ounce. The difference is that they aren't dark chocolate and we all know what that means... no antioxidants. If you're going to indulge, you must be able to say it's good for you. Am I right? So... bake brownies according to package or recipe directions. 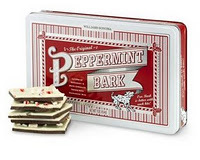 While brownies are in the oven, unwrap the peppermint bark and break into pieces. The minute they come out of the oven, drop broken pieces of bark onto the top of the piping hot brownies in pan. Wait a minute or two for the candy to become soft and gooey. Gently spread it around with a spatula or knife until all of brownies are covered, adding more if needed. If you want to fancy them up and take them out to a party, you can add some chopped up peppermints. The pink, white and red flecks scattered over the dark, fudgey squares are SO festive! Cool and cut into squares. Place on a sparkly holiday platter or devour them immediately, washing them down with the coldest milk possible. Merry Christmas eating! These are the best brownies ever! I am an addict.